A good Samaritan, someone who was driving by, helped get the Elkhoueirys out of their burning home on Birdsnest Place, rescuing two of the children inside. Investigators said the fire started in the fireplace, and it was the banging of the passerby that alerted the family to the danger. News4's Julie Carey reports. 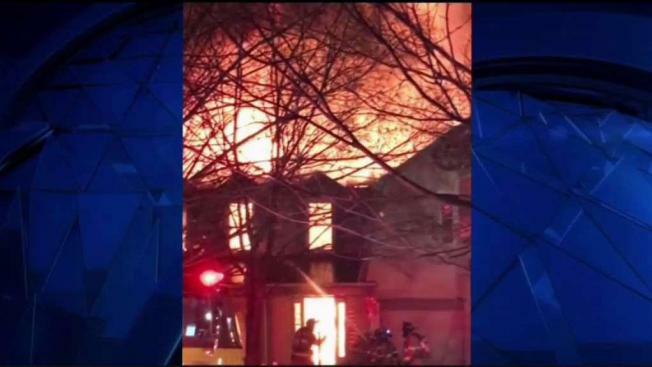 A fire on Friday night nearly took everything from an Ashburn, Virginia, family, but their community has rallied to help them bounce back from the blaze. A good Samaritan, someone who was driving by, helped get the Elkhoueirys out of their burning home on Birdsnest Place, rescuing two of the children inside. Investigators said the fire started in the fireplace, and it was the banging of the passerby that alerted the family to the danger. A neighbor swooped in to help, giving the family a place to stay on the night of the fire and providing a refuge as the Elkhoueirys try to regroup. In the aftermath of the fire, Rita Elkhoueiry was overcome with gratitude. Speer and other neighbors set up a GoFundMe page to help the family. They also put out the word on Facebook, and Ashburn residents started showing up with donations, including children’s clothes, new boots, and toys for Lea, 3. The donations were so numerous that it took two garages to hold everything. The Elkhoueirys were renting the home, but after this experience, they are determined to stay as close to Birdsnest Place as possible when they find a new place.